I know I need to run because over the decades (I’m 45 now) I’ve taken several breaks from running – some of them quite long – and every time I’ve stopped I’ve started to fall apart. Weight gain, atrophy, and increased tiredness, soreness, and irritability are just some of the symptoms. But when I’m regularly getting my miles in, I almost invariably feel better, look better, eat better, sleep better, and have more energy and enthusiasm for tackling life’s challenges and appreciating life’s wonders. This is what I love most about running – not the act itself, but the results. Much of my race “hardware” collection, from 5k to marathon and everything in between (and more recently, sprint triathlons). I sign up for races primarily as a way to keep me focused on a tangible fitness goal. Even if my times aren’t all that competitive, races are usually a lot of fun. In fact, I consider running to be a foundation for wellness. I may enjoy certain fitness activities more (e.g., mountain biking, hiking, and sports like soccer or racquetball), and I know that running isn’t for everyone, but I keep devoting time and effort to it because it builds cardio fitness and burns calories like no other, enabling me to do those other activities well. Also, while challenging, it is easy to do: At almost any time I can simply throw on exercise clothes and a pair of running shoes, step outside, and push myself to whatever limit I choose. Finally, to me, a good run provides a nearly unrivaled stress release and sense of accomplishment. With so many benefits, what’s to hate about running? Put simply: I can be lazy, and running is hard. I may be working toward a fitness goal or training for a race, and may have plans to run two or three times in a given week (alongside other workouts). Regardless, often when I approach a run I first have to get past a mountain of self-inflicted resistance. Feeling allegedly too tired or sore to get out there. Thoughts of upcoming hills I’d really rather not climb. Doubts about whether the effort is worth it. A dozen seemingly valid excuses why I should put it off to another day. And indeed, sometimes I end up bailing as a result. This is almost always my laziness talking, and my desire to avoid what I know will be a somewhat grueling effort. 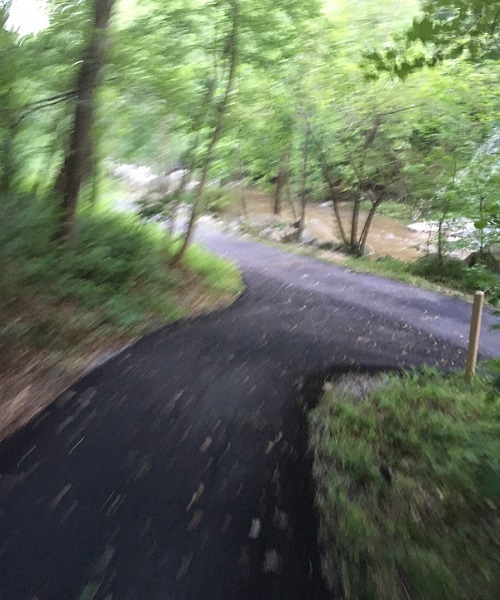 For example, a few days ago I planned to do a 3.65-mile evening run – one of my regular routes on a nice trail system that meanders through the woods and along our local creek. I had no good reason not to follow through, yet as I started slowly putting on my workout clothes and the time to hit the trail got closer, I began the all-too-common process of bargaining with myself. First I began wondering if it was too hot and humid and whether I should wait for a cooler day. (It was uncomfortable outside, but I’ve faced far worse.) Then I wondered if the mild foot pain I’ve been feeling was a sign that I should hold off. (Avoiding injury is a legitimate concern, but this particular issue has only been a slight and intermittent nuisance.) Then I thought, “It’s Friday at the end of a long work week – shouldn’t I just relax, spend some time with my family, and pick this up tomorrow?” (My family was happily occupied with other things and wouldn’t miss me for the 40 minutes or so I’d be gone.) Finally, after about 15 minutes of procrastinating and wavering like this, I found the resolve to lace up my shoes, push ahead, and step out onto the pavement. An “in motion” shot along my favorite local trail in northern Virginia, which picks up just down the street from my house, meanders through the woods, and then continues alongside our local creek. I can readily do anywhere from about 3-10 miles on this path, which has a nice mix of flat and hilly terrain and great scenery. When I do get past such mental resistance, then the run itself is not exactly pleasant. There are certainly moments of strength and beauty and cruising along in a state of semi-bliss, but most of it is a lot of hard work, to include powering through burning muscles, shortness of breath, aches and pains, unpleasant weather, and periods where I just want to quit. However, it is often in conquering a challenging hill, or reaching a certain milestone, or experiencing a gorgeous stretch of trail, or crossing the finish line and seeing I’ve met my goal, that it all becomes worthwhile. And it is after the run, in facing the rest of my endeavors with greater strength, confidence, clarity, and calm, that I realize the full value of my time on the trail, and that I will need to get back out there – again and again and again. 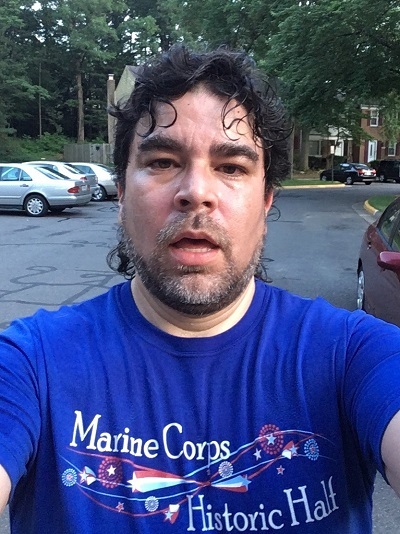 Last week at the end of a tough 3.65-mile evening run. It was hot and humid and I was dealing with some mild soreness in my left foot, all of which slowed me down and made the run feel harder than usual. Still, I was proud of myself for following through with it, and I definitely gave it my all.